You’re in an argument with your child. Their behavior was out of control, they wouldn’t listen, you lost your cool, and the situation intensified. By the time you realize what has happened, it’s done. How do you save face? How do you handle the next disagreement? You cannot fix what is already done. Whatever happened, big or small, the words have been said, the actions have been completed. The past is the past and no amount of rehashing or self-punishment is going to change it or make you feel better about the situation. An apology can go a long way. You are human and no human is perfect. Own up to your mistakes! Often, kids can be taken by surprise by an adult saying “I’m sorry for losing my temper. Today has been really tough for all of us, hasn’t it?” Kids are often expected to apologize for things they have done, but do we adults always follow through on that expectation? Offering an apology is not only a great teachable moment for your kids, but it also shows your kids it is safe to make yourself vulnerable within your family. Move on. Give yourself permission to move on. As human beings, we all do things we aren’t always proud of. Ruminating on these situations does nothing but makes our brains stay in those negative, gunky feelings. Give yourself some grace. So, how do you handle the next behavior issue? First of all, DO NOT take things personally! Kids are not in control of their behavior when they are mad. 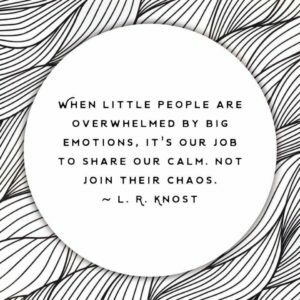 If you personalize this situation, kids then lose their stability in the moment and may feel that you are not a safe place to bring their problems to. It’s not about you. In the heat of the moment, their brains are firing from a different place- a place full of body memories from their past. As parents, you have to help them bear their storm. They need you to help them get back into control. I’m sure we’ve all had situations where we know reprimanding during the behavior is not going to go well. Sit with them at their level. Breathe. Demonstrate what you want their body language to be. Wait until it is done, then ask “what do we need to do to make this better?” or “how can we help you fix this?” Maybe it’s an apology or replacing a broken item. Have your kid help identity an appropriate consequence for the behavior. Feel free to share your insight on this. What has worked for you? What hasn’t gone so well? Remember, go easy on yourself. You aren’t alone in this! What Do Our Children Need From Us?